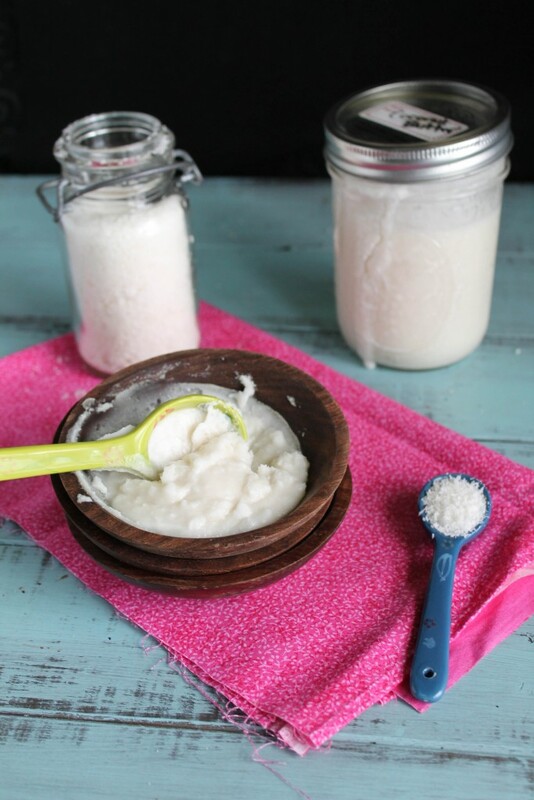 Coconut butter can be super spendy, and when you can easily make your own, it is a great way to save some money! With one ingredient, you can make this healthy, versatile spread today! Love. I love this creamy, rich spread. Loaded with MCFAs (medium chain fatty acids), this once shunned superfood has been reborn with new research and understanding of it’s healthy profile. Simply, medium chain fatty acids are easily assimilated into energy within the body, fats your body NEEDS! So instead of storing it as fat, your body can USE it for energy!! I remember when I first discovered coconut butter. My sister and I had purchased a jar of this not even knowing the difference between coconut oil and coconut butter. (We figured they were same!). Coconut oil is just the oil,and coconut butter is all the coconut flesh INCLUDING the oil!! We simply wanted to make a recipe of Samoas, and the recipe called for it. But at one taste…we were hooked. And you will be too. Trust me. From NaturalNews.com: Coconut oil/butter is high in medium chain triglycerides (MCTs). This saturated fat is considered a rare and important building block of every cell in the human body, and can actually reduce cholesterol and heart disease. It boosts immunity, kills bacteria and viruses, protects against cancer and other degenerative diseases, and prevents osteoporosis by promoting calcium absorption. It also slows down aging and is good for skin radiance. This is one of those posts that I even hesitated to write. I figured most people already knew how to do it. But I also know there are some who do not, and that for some of you, coconut butter might be something new and unfamiliar. And really, this creamy spread is so easy, anyone can do it, it just takes a tiny bit of patience, and 5 minutes of your time. And time is valuable in our busy lives, I know I would rather be playing yet another rousing game of “Busytown” with my kids than always being in the kitchen! Let’s also consider it costs upwards of $8 for a jar in the grocery store! This is a much more frugal option, and a very attainable luxury!! You will need either a high powered blender (like a Blend Tec or Vitamix) or a good quality food processor like my Cuisenart to do this successfully! With its high antioxidant properties, coconut butter lasts for awhile (months) in the pantry!! If you end up adding some coconut oil to the mixture, it will be slightly more spreadable at room temp (70 degrees or so). But throughout cooler temperatures, the coconut butter is hard! For smoothies, I just chisel some out for use. For other uses, I prefer to just heat the butter slightly for 20 seconds in the microwave, or leave it a warm place on my stove. When it is actually warm outside here in the NW, this takes care of itself. and the butter remains more soft. If you are a visual learner, I have a video you can watch! It is a bit long, but until I figure out how in the heck to cut clips out, this will have to do! 4 cups unsweetened, dried, grated coconut It is important not to use less than 4 cups, you need the volume to get the whole mixture moving. 1 tablespoon Coconut oil, if needed this is only necessary if your coconut does not liquefy on it's own. Option 1 in a Blend Tec or other high-powered blender: Place coconut in and turn the machine on to level 1 or 2. The mixture will quickly climb the sides and leave a empty space around the blade (see image). Turn off, scrape the sides down, and repeat this process, many times! 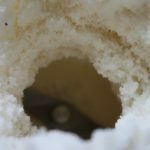 OR, if you feel confident enough, just leave the lid off, and using a spatula or other long handled instrument, just keep pushing the climbing coconut back into the vortex, careful not to get your instrument in the blade! Eventually, the heat from the machine starts releasing the oil, and the mixture will start to move freely without any scraping. 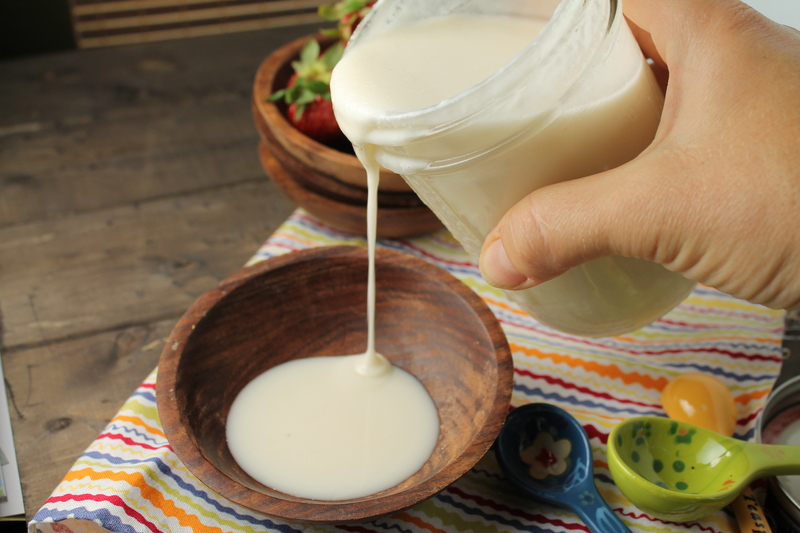 Once liquified and running smoothly (see image), puree for about a minute or two until silky smooth! Store in an airtight container in the pantry. Once cooled, the butter will harden. Option 2 w/ a Food Processor: This is the same process as above, however, it will take longer to get to the liquified state, so you will need to use a bit more patience and few more repeats of the steps! It is also worth noting that it will not get quite as smooth, it is just not as powerful of a machine! Sounds like my Vitamin and it’s tamper will be perfect for this job! I’ve heard one too many horror stories to ever consider, let alone suggest to anyone else, leaving a machine running with lid off while carefully scraping it down! Yes, a tamper is much safer option Jessica!! LOL! I could eat coconut butter all day long. YUM!! And I love that it’s so easy to make at home. 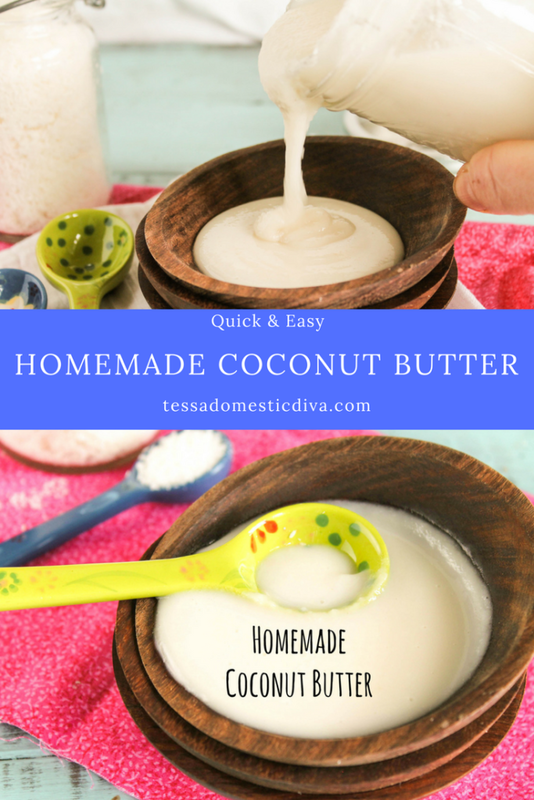 I never knew coconut butter was so easy to make! Can’t wait to try this. Great, easy to follow directions! I need to get a high powered blender so I can try this! I recently fell in love with coconut butter. It’s so good. Have been meaning to make it at home now I have the perfect recipe for it. Awesome ! This stuff is liquid gold. I am going to finally make it thanks you Tessa! Oh wow, I didn’t even know you could make your own. I’d love to try this method and keep some on hand. I love it just mixed with some cacao or fresh strawberries for a quick fat hit. I keep buying coconut butter for convenience but it is seriously so easy to make! This looks great – my kids love it on their pancakes! Renee Kohley recently posted…On-The-Go Instant Pot® Mini Frittatas :: 5 Minute Pressure Cook Time, Freezer Friendly, and Dairy Free! Never thought about making my own coconut butter before! Can’t wait to try it! Love homemade coconut butter! So incredibly easy and delicious. I’ve never heard of coconut butter either until recently. I just received my jar I ordered from amazon. I’m so excited to begin using this amazing and health super food. I’m going to have to do a lot of searching looking for recipes. If you have any great sites for me p!ease let me know!!! My grandson and I opened it as soon as I got it, and oh my goodness, the flavor and texture is marvelous. BTW, thanks for instructions for making my own as it will come in handy. Thank you soooooo much. ? My favorite way of late is spreading in a sliced medjool date…add a drizzle of chocolate and it is like a healthy snickers Joyce! I came across a recipe for sugar free fudge that called for coconut butter. Having never heard of it I looked for recipes/instructions on how to make it. Came across your tutorial; went ahead and bought some coconut only to find out it was sweetened, so back to another store. Just made it in the Vitamix. Seemed rather dry, even with coconut oil added. Eventuallly it creamed and I went ahead and made the fudge. It is somewhat beige in color, not white. Seems kind of gritty to taste. Is that normal? Hi Nina! Coconut butter can make some delicious fudge, for sure!! Most likely, your coconut shreds did not have a lot of oil content (possibly old or not very fresh), it only takes me 1 or 2 45 second cycles max on my Blend Tec to cream it. There is some subtle grittiness left….no way to avoid that completely unless you buy a jar of it….Artisana is really good! I have never seen it beige…that again has to go back to the shreds you were using, or maybe if you blended long time it got too hot? Good news is, coconut butter can be used like coconut oil and nut butters in recipes, so there is no reason to waste it…it should function well enough in recipes if you like the taste! Sorry you had such a hassle! My batch today was a subtle tan color. (I know this post is older, but maybe someone else can benefit from the info.) Mine was taking a little longer to reach the butter consistency I like and I suspected it was do to winter temps arriving and a much cooler home. I began making this in the spring and have never had an issue. A phone call interrupted me today & I flipped the Vitamix from highest setting to low, but it was not off. My mistake, as I made a mad 3min dash for info, and this batch resulted with a hint of light tan color. I think the coconut got a little too hot in the blending process. I recommend taking some pauses to allow cool down while blending the shredded coconut into butter. After you see the coconut begin looking like a very, very lumpy iced frappichino, I suggest taking 1min-2min pauses in blending, resume blend for 1min, then break and so on, until you get the consistency you desire. Also feel the exterior temp of your blender. It’s not always going to reach butter consistency as quickly when it’s colder in your home. If you are adding additional oil during your blend, really watch your temps depending on the type. sounds like you ‘toasted’ the butter Liz, hopefully it was still tasty! this looks easy enough to make but what do you use this butter for? On what or with what? Hi Gisele, I listed several ideas above! I also use it to replace nut butters in some paleo recipes to keep it nut free. Anyways…thank you for the recipe! I love coconut butter and I was wondering…would cocoa powder and honey go good with this?? i have done that many times, it is YUMMY Kelly! At the present, Take these products and modify your life style. Transform your life style! Do you want to modify your life style? It is no matter. That makes you good-looking. I love coconut butter! Ran mine for a very long time in my vitamix but it never liquified! I definitely used a minimum of 4 cups, and ran for probably 8 minutes or so, but no liquefied coconut butter! Any hints? to get it as creamy as possible! do you know if coconut oil is ok for someone with high cholesterol? Hey there gavriellah! I am not a doctor and don’t profess to be one, but in all my research and reading, I believe cholesterol and saturated fats (the fats that are high in coconut oil and animal fats and blamed for high cholesterol) have been incorrectly linked. Here are some articles you can read to make your own decision. I believe coconut oil and butter are healthy fats that should be enjoyed for good health! Just as others, I adore coconut butter but my wallet does not. So I knew I had to learn to make it! My favorite way to use coconut butter? Stuffed in medjool dates! Yep! So decadent tasting but healthy! Yum! Why, that sounds amazing Kenzie, thanks for sharing that idea (I think! ), could become a new addiction! Question. I don’t have a high powered blender so I just used an ordinary one. Is that why I still have chunks of coconut left? Most definitely, a food processor works well too, it just takes longer. A regular old blender will almost definitely not have the power to pulverize the coconut. I have to try this! Thanks for sharing on Wildcrafting Wednesday! This is such a simple process if you have a decent blender or food processor! Unfortunately mine is less than awesome. Hopefully I will be able to get one with a little more stamina soon. We are just getting into using coconut. Thanks for linking another great recipe to Tuesday Greens! This is a great post, I looking forward to trying this Coconut Butter. Thank you so much for sharing with Full Plate Thursday and have a fabulous weekend. I have always wondered how to make that!!! Thank you so much for this tutorial! I can’t wait to use it in Thai recipes to see how it works. I LOVE coconut butter, just poured or flaked on fruit. Although I’ll probably still buy it, I do appreciate seeing how it’s made. I didn’t realize it was so simple. Thanks for posting! I’ve tried this several times with no luck, but I didn’t know I needed to use a minimum of 4 cups. You’ve inspired me to give it another go. Thanks! I can help you troubleshoot if you need it it Tina, always happy to help! I am an expert at this by now with weekly batches! Wow – thank you!!! I am no stranger to eating healthy, and eating whole – but with all of the “greenwashing” and “healthwashing” out there it is difficult to sort everything out. 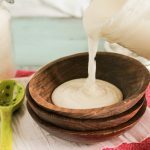 Thank you for clarifying the difference between coconut oil and coconut butter – and for your very easy tutorial on how to make it – I will definitely be doing so, your link to recipes has made it so easy to incorporate into my family’s diet! Thanks so much for posting this! I had no idea how to make it myself. How long will the butter last? Do you have a recipe for coconut cream? quite a long time amy! Coconut is very high in antioxidants! Coconut cream and coconut butter are the same thing…at least to my tastebuds! could i put this in no bake cookies? i love them, but i haven’t been able to eat them since I’ve become allergic to peanuts.. 🙁 Thank you so much for this post i didn’t realize it was so eay to make this!! Hi violet! Yes, this could easily make a no-bake cookie, but the recipe would need to be worked with a bit to bind and achieve the texture you are familiar with. have you ever tried sunbutter? That would be the closest thing to sub peanut butter with….I also have a post on how to make your own there too! I use freshly grated coconut that I dry in a dehydrator. My butter doesn’t come out white though. It is a light beige color. Is this because it is not commercially dried? My butter doesn’t harden but stays a thick liquid. I sometimes pour off some of the oil before I stir it up to use it. It does taste delicious. hmm…no idea. It is possible the fresh coconut browns?Do you live in a warm climate? It sounds as if there is more oil in your mixture…a mystery1 I would need to recreate your version to troubleshoot Meady! Yes, I live on Guam. I husk some coconuts every Sunday for the following week. I’m thinking that the commercially dried coconut might have some of the oil removed during processing. It just might….and they may use a different variety, mature vs young too! Coconut oil and butter stay soft in warm temperatures, I just live in the us NW, so we are much cooler here. On hot days in the summer, it is much softer…but never with a layer of oil on top…. just a bit…there is slight grainy texture. Ok, so just realized that I was supposed to use dried coconut. I really wanted to try a fresh coconut and didn’t realize it wouldn’t work. Grr… so I guess I’m gonna dehydrate my coconut and try again another day. I was thinking it was going to come out so creamy, but I know better now. Hi Carlaena! You will LOVE coconut butter!! I am glad I could introduce you to it! I totally admire your diligence too: 1.5 hrs! Wow…I am impressed! There is too much water content in fresh coconut to make a butter. But you have made a a super fine grated coconut it would seem!! I have luck with making my own coconut milk using fresh…quite delish, and throwing some in smoothies in another treat. If I can help in anyway, let me know! Ok, so I tried this in both my food processor and then transferred to my KitchenAid blender. I couldn’t get it to work. For like an hour and a half. Just very fine, like macaroon coconut. The machine definitely got warm, the coconut feels moist and oily. I wanted to use it for a coconut frosting. 🙁 Do I just need to use a different blender? Would an immersion blender work? Otherwise, this looks fantastic. I am someone who didn’t even know coconut butter existed. Thanks! This is THE BEST coconut butter tutorial I’ve found! This time my coconut butter actually turned out BUTTERY! YAY! awesome Shannon, so glad you found it helpful!! I so adore coconut butter!! now what are you going to do with yours??!!! Recipe sounds great. Do you think I could do this with fresh grated coconut or do I need to use the dried so the water content is out? I live overseas and while I can sometimes by dried unsweetened it is by no means inexpensive. On the other hand – we buy monster sacks of coconuts when driving south to north and I grate them out and freeze the meat so I have bags of fresh coconuts lying around. Hi Robin, great question. I am pretty sure this would not work with fresh coconut meat. You could however find out how to dry it out in your oven if you have it shredded already. I think with fresh it would be more a very rich coconut milk. If you DO try it, let us know so others can benefit from your experience. Awesome idea Lisa! I LOVE toasted coconut. Hi, I have made this and I stored it in the fridge, is that necessary? I’m finding I don’t use it much because it’s so hard to remove from the container. Most definitely not, it solid at room temp. 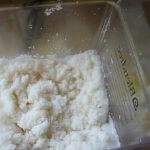 I warm it slightly either in microwave or a warm water bath to soften. Check out my Decadent Chocolate Raspberry Torte for a great use of your butter! I also love adding it to my smoothies for healthy fat and delicious flavor. Thanks for your question sandy, if you need more ideas for how to use it, let me know! I smack my blend tec around for that too!! Thanks for sharing your tip! I made coconut butter this weekend for the first time and my hubby wont stop eating it! It did take a while in my food processor, but worth it. I noticed my store only carries “reduced fat” coconut – do you know if this will work or should I drive farther to the health food store for the regular? Thanks for sharing this! Hi Paige!i agree with your husband, I could eat this stuff all the time! I would hazard a guess that low fat would not work. Since much of the oil has been removed, there wouldn’t be enough oil released to liquefy it. I order mine online, it is a great deal that way! There is a link in the post if you are interested, and iherb.com is another great place And you only have to spend 20 to get free shipping, plus if you click the badge in my side bar, you get $5 off your first order! We go through it pretty quickly, so bulk is the best deal for us. bummer Sam! Sunflower seed butter is another favorite in our nut free house for pbj’s! I tried this last weekend and just could not get it to work. I have a high powered food processor that I make peanut butter in all the time that I used to try this. It kept looking like it was about to change into something smooth and liquid-y but it just never did. Off and on for 1/2 hour (I was persistent! 🙂 But in the end it was just more finely ground coconut. I even added a touch of coconut oil towards the end to see if it might help it make the transition. Any thoughts why it might not have worked? How frustrating Sharon!! I am sorry! What type of coconut did you use? (brand and type) If this didn’t work, it would have to be that!! I use Let’s DO Organic Unsweetened Coconut, it is linked in the post, but lots of natural foods stores carry it, about 3 or 4 dollars a bag. Online I pay 2 something. Others brands would certainly work! Was it a low fat one you used? Pretty sure that wouldn’t work, as you need the oils to be released to get it creamy. There was nothing on it that made me think it was low fat, but I’ll see if I can try again with another brand and see if I can get it to work! Thank you so much for this recipe! I make coconut milk, use coconut oil, but never knew about coconut butter! Thank you for sharing it! I LOVE homemade coconut butter! I find that with a VitaMix, you only need 2 cups coconut (I used the tamper to keep it from creating that hole in the middle, which seems to work). My favorite recipe is a coconut bark I made a couple of years ago, to which I added carob and spices. 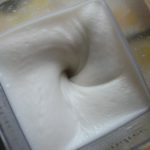 But I’ve been playing with coconut butter-based frostings recently, and am loving the results! LooksSO good….I would like some now…my waist line would not! YUM! Do you ever put anything in it (salt, etc.) to season it for spreading? No Michaela, but you could if you wanted! Let your tastebuds be your guide! I HAVE however, blended it with fresh strawberries, or cocoa powder, or fresh mango for a different flavor….YUM!! The fresh fruit will shortent the life of the that butter, so only make a small amount if you do that (blend it separately in a food processor. The cocoa is fine though! I am really having a problem getting passed your code today, I have tried 4 times on the Blondies and it still wont let me by. Your Coconut Butter looks awesome! Hope you are having a great week end and thank you so much for sharing with Full Plate Thursday. There is so much talk about the nutritional value of coconut this was really interesting. Thanks for sharing it and your other recipes on foodie friday. I am surprised by how many people are discovering it via this post, and OH so excited to introduce you ll to something so utterly amazing! I realized I forgot to post a couple of easy adpatations…..blend with fresh mango or strawberries or cocoa powder! Great post Tessa. You make it look so easy. It’s definitely something I want to try. Please do Laureen…you will not be disappointed! And it IS easy! Knew about coconut milk, oil, but never about coconut butter. wow! Thanks a lot for this post! See Minnie, I KNEW I needed to post this! I sometimes forget that I am very well-exposed in to all tings healthy in the food work and take for granted everyone else is the same! Love to hear what you think after you make it~! I’m so glad you decided to post this. I’ve never heard of coconut butter. I am very excited to give it a try though. I even pinned it to try out sometime this week. Thanks so much for sharing with Hearth and Soul!! yay Elsa!! So glad i get to introduce you to this little gem, I just know you will swoon right along with me..let me know how it turn out for you! I always buy it as well, but it is so darn expensive. Thanks for teaching me how to make my own coconut butter-I bet it tastes amazing so fresh! And after you make it, you’ll wonder why you hadn’t before Laura!! Enjoy! We are still bying ours, but with the price of it, I know we need to start making it. It is really expensive and I can see why some people find it cost prohibitive to use it. Thanks for this super easy and cost effective method! OMG! So simple and cost effective. I love Coconut butter. Thanks so much for the recipe. Wow, what a helpful post! i knew that coconut oil was an amazing superfood (that makes incredible frosting 🙂 ) but i didn’t know about coconut butter! I didn’t know the difference either!! i definitely need to try this! Thanks for sharing!